Warren Joyce, rattled by last week’s bloodless effort against Sydney, took a sledgehammer to his starting XI, changing both the formation, and the players who make it up. Returning to a back three, Nathaniel Atkinson began as right wing back, shunting Ritchie De Laet into a right-sided centre back role. Dario Vidosic was relegated to the bench. And in midfield, Luke Brattan was dropped from the squad entirely. The lack of penetration last week was evident, and as much as Joyce urged otherwise pre-game, it appeared as though Brattan had been held most responsible. 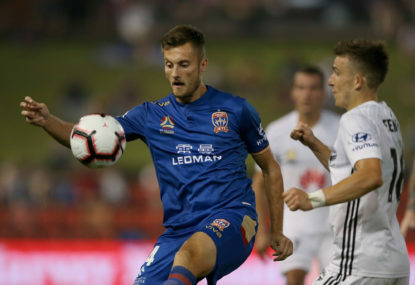 Wellington were without Nathan Burns, away celebrating the birth of his child, but had a front three of Roy Krishna, David Williams and Louis Fenton. With Mitch Nichols and Sarpreet Singh in midfield, the Phoenix certainly had offence to burn, on paper if not on the AAMI Park pitch. Phoenix began the game as the more lively team, but City looked fuelled by a healthy appetite for forward progress on the break. It took just eight minutes for the game to burst open, like a fight in a tent suddenly tearing through the canvas, as a neat sequence down the City left saw Lachie Wales curl a cross from the byline all the way through the Nix box. It was crying out to be struck first time, and as it was De Laet running uncontested towards it, there was a sense immediately of the purity to come. De Laet is a very good player, and his ball-striking was perfect here, smacked low and hard into the bottom right corner of Filip Kurto’s goal. At this point, with an early goal having given them the whiff of blood, we would see exactly how merciless City could be; Joyce’s bridles were off. 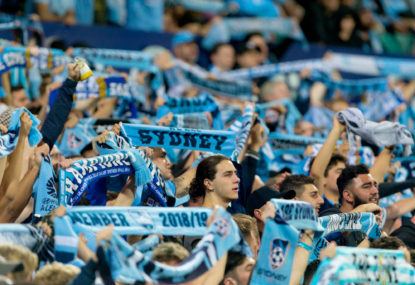 Wellington had been flattened by the Wanderers last weekend, and were perhaps heading toward the mangle again here, if City were prepared to crank it. Atkinson was playing so high up the pitch when City had the ball, he was, for all intents and purposes, a winger. 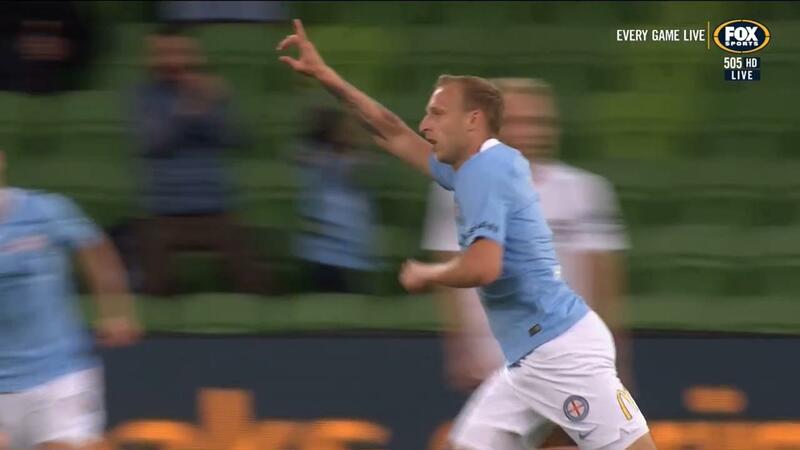 De Laet was therefore permitted to act in his natural role as an attacking full back. The arrangement bore fruit in the first half, as De Laet surged forward causing pangs of distress across the Phoenix defence. It was an encouraging sign of the normally mulish Joyce’s willingness not only to spruce up his attack, but do so while retaining a system that continued to draw the best out of his imported attacking full back. It was, in all honesty, a hugely refreshing tactical flourish. City were a team transformed, savaging mauling at every opportunity to raid into the Wellington defensive third, an image of offensive aggression when last weekend they had been more an ode to apathy. 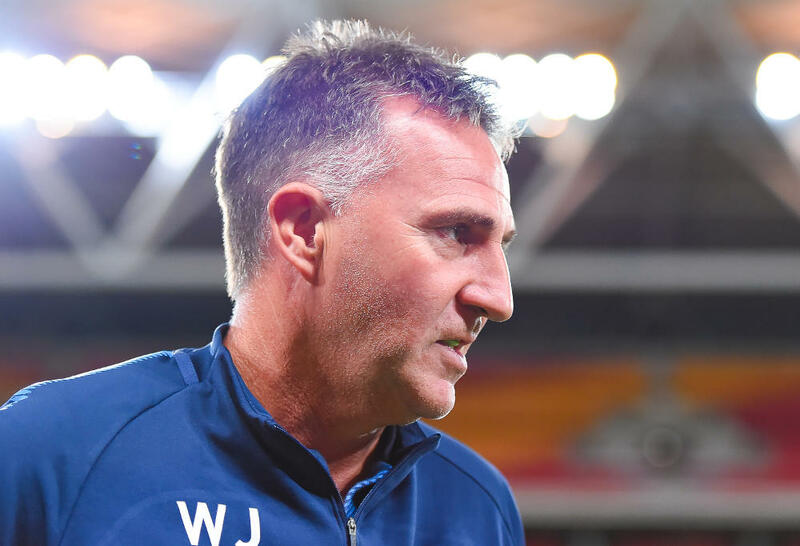 Wellington were a little overwhelmed by this City flurry, with Mark Rudan fuming and bug-eyed on the touchline, looking as though he was about to charge onto the pitch and two-foot a City attacker himself. Wellington held on, and went into the dressing rooms at half time 0-1 down. The seagulls had descended during the break, and were, to be frank, more densely filling the unoccupied portions of the pitch than the City fans were the stadium stands. Vidosic was an early sub, coming on for Atkinson, prompting Wales to switch flanks. The system wasn’t quite incorporating Fornaroli; all the action – the overlaps, the interchanging of position, the speed and purpose – was on the flanks. Fornaroli was not required to cycle out wide – indeed, he would have crowded things had he done so – and although his instincts are good as far as off-the-ball runs and the offside trap go, Fornaroli is really at his best when he is involved in all facets of the attacking play, feeling the ball, playing combination passes, holding off defenders and feeding his teammates. 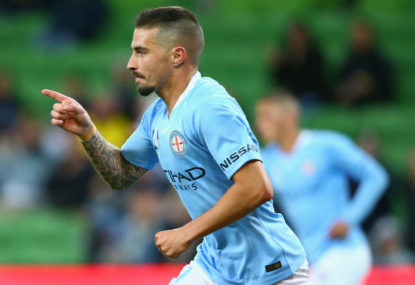 According to the A-league tracking stats, Fornaroli made just eight passes all evening. His role here was largely disconnected from the meat of the action. That is, until the first time City managed to rat-a-tat some passes in the middle, around the edge of the box. Then Fornaroli came alive. 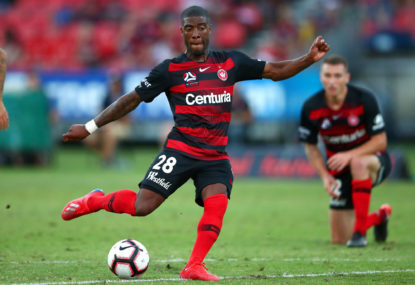 An interchange with McGree – a formidable combination, if it blossoms this season – saw Fornaroli plant his studs on the ball, and curl a looping shot over Kurto from the edge of the area. A perfect parabola escaped the keeper’s pawing fingers, and City had a second goal they richly deserved. The VAR intervened with 20 minutes to go, and although the pitchforks are racked on this one, this will take some explaining: a Wellington free kick was taken short, and shot was hit first-time. It appeared to strike a City player’s arm, and referee Adam Fielding awarded another free kick, on the edge of the box. The VAR looked at it, and revealed that the ball-to-hand contact had occurred inside the area. When Fielding reviewed on the monitor he saw what was fairly obvious – although what tends to be concealed by slow motion, which almost always erroneously expresses confected intention for handball replays – to any reasonable witness. There was no intention behind the handball, having been pegged at close range at a hand tucked into the body, but instead of having to stick with an incorrect original call, Fielding reversed his decision and staged that rare event, a contested drop ball. Wellington were furious, but would have been beneficiaries of a bad VAR call. 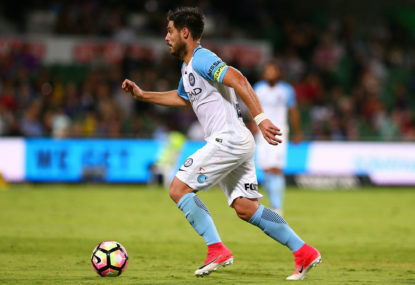 Fielding was wholly correct, but the process of rejudging a mistaken call – which wasn’t technically under review by the VAR – teased out memories of the failure to do just that in the Melbourne Derby earlier this season. VAR, you never fail to intrigue. A seagull was struck by the ball, poor thing. Laid prone, and rather hurriedly, at the feet of a bewildered ballboy, the bird would eventually recover; the Phoenix would not, and a 2-0 defeat now compounds their recent woe. City were revitalised, refreshed, and look irrepressible here, and McGree and Wales in particular were excellent. 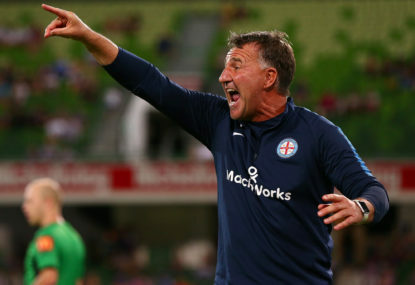 Ah, the heady highs and leaden lows of a Melbourne City A-league season are always fun to ride, but consistent potency will be the true hallmark of progress for Joyce’s team.